On this date in 1452, Leonardo da Vinci was born. A true Renaissance man, he was an architect, musicians, engineer, sculptor, and painter. Here are 10 of Leonardo’s important creations. The Virgin of the Rocks was commissioned in Milan for the Confraternity of the Immaculate Conception to fill a large altarpiece. The painting depicts an infant John the Baptist, protected by an angel and worshiping Christ, with the Holy Family on the road to Egypt. Set in an untamed wilderness, it shows Leonardo’s interest in nature. 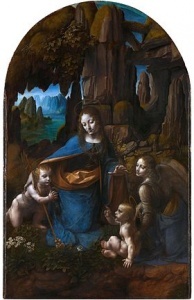 Leonardo painted two versions of this work, one which now hangs in the Louvre, and the other in London’s National Gallery. In January of 1478, Leonardo was commissioned to paint an altarpiece for the Chapel of St Bernard in the Palazzo Vecchio, one of his earliest independent commissions. He departed for Milan the following year, and the painting, The Adoration of the Magi, was left unfinished. The Holy Mother and baby Jesus are in the foreground, and the magi kneel in adoration, creating a triangular shape. 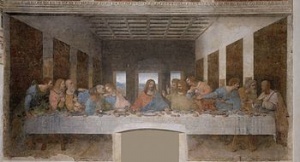 It is thought that, in the semi-circle of figures in the back, viewers can see a self-portrait of Leonardo on the far right. 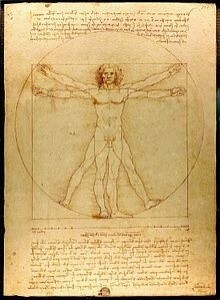 The Vitruvian Man is an incredibly well-known sketch by Leonardo. Based on the work of the architect Vitruvius, it explores the proportions of the human figure. The circle and square in which the human body is shown speak to its proportionate nature. The notes surrounding the image state these proportions, such as that the length of the outspread arms is equal to the height of a man, the elbow to the armpit is one-eighth the height of a man, and the maximum width of the shoulder is one quarter the height of a man. The Last Supper was Leonardo’s most famous painting of the 1490s, and one of his most famous paintings of all. It depicts the moment at the Last Supper when Jesus declares that one of his disciples will betray him. It was commissioned for the refectory of the Convent of Santa Maria della Grazie in Milan, where it may still be seen. Leonardo used an experimental technique for this work rather than a more reliable method of painting a fresco, resulting in rapid deterioration. In 1502, Leonardo became employed by Cesare Borgia, son of Pope Alexander VI. 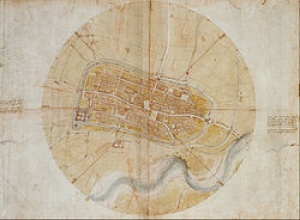 Leonardo created this map, a new concept at the time, in order to win his patronage. The map worked, and he was hired as chief military engineer and architect. 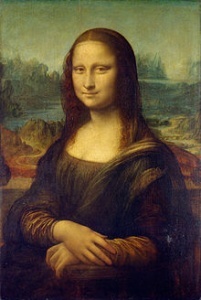 The Mona Lisa, also known as La Gioconda (The Laughing One) is possibly the most famous painting in the world. One of the most famous aspects of the painting, alluded to in the Italian title, is the subject’s elusive smile. 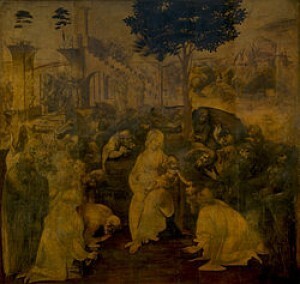 This work shows the sfumato technique for which Leonardo would become famous, in which line are blurred to produce a hazy or smoky effect. 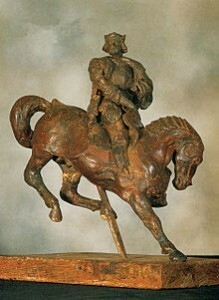 Horse and Rider is the only of Leonardo’s sculptural works known to exist today. This is a beeswax sculpture, and was intended to be a model for a larger commissioned sculpture, but Leonardo died before it was completed. It is believed that Leonardo’s thumbprint can also be seen in the wax. 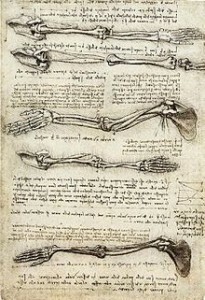 Leonardo’s scientific interests and interest in the human body intersected in his study of anatomy. 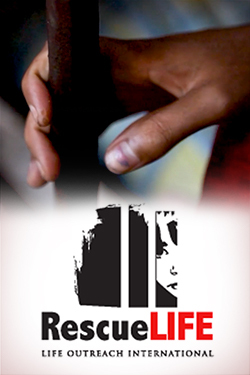 He was given permission to dissect cadavers at hospitals inFlorence, Milan, and Rome. He made more than 240 detailed drawings from these dissections and wrote 13,000 words on anatomy. Leonardo’s St John the Baptist (1513-1516). Louvre, Paris. 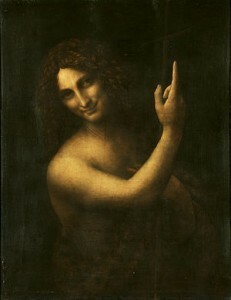 St. John the Baptist is one of Leonardo’s later paintings, perhaps his final. Details such as the elongated fingers show that the style is moving from high renaissance to Mannerism. The smile and use of sfumato may remind viewers of the Mona Lisa.